Here we are back at another Monday! Today is one of those days I am walking like a penguin, using as little muscles as I can. Usually, my own strength training is broken up into legs, arms and abs. I prefer to have just one body part sore at one time. However, that is not the case today as I took 3 group fitness classes yesterday which worked every muscle in my body! I started my Sunday morning teaching cycle class at my all women’s gym! I love the energy of the women in the classes I teach. No matter how tired I am, they make so happy to be there every weekend. After class, I headed out to Los Angeles for the Bootcamp & BodyWorks + Abs Training/ Certification. Yesterday was the first step to being able to teach these classes at my gym. Some instructors may be teaching these formats already because they have their group fitness certifications. The training classes are meant for them as well as others who want to add these formats to their list of classes. I am in the first category in regards to Bootcamp since i am already teaching but in the second when it comes to BodyWorks + Abs. First up was BodyWorks + Abs. The training started with the teaching portion which included the breakdown of class format, instructor guidelines and exercise instruction. The student in me was so happy with this portion as I love to learn. As my next step in regards to fitness training is getting certified as a personal trainer, I was excited to learn more about proper form and alignment. BodyWorks excites me because it is still high intensity to match my intense personality but the main goal is to do higher reps with lower weights. After the teaching portion came a BodyWorks class for the instructors. It was a very fun hour of doing a different class structure (hey I am counting it as trying a new class) and getting to experience another instructor. Plus, having 50+ fitness instructors from So Cal in one room together makes for an energetic and loud class! 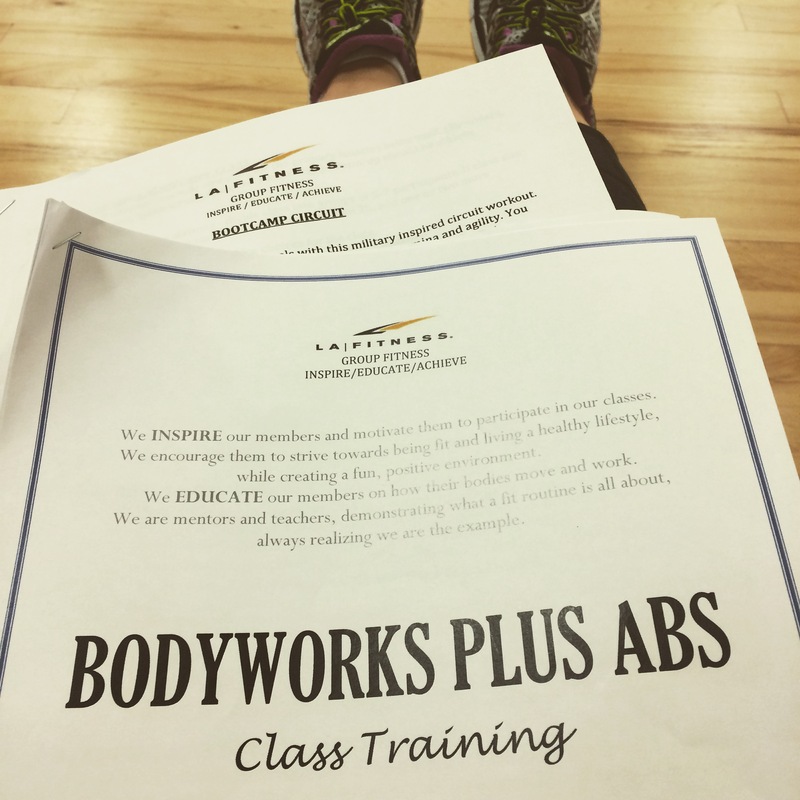 I finished the class drenched in sweat and very excited for the chance to add BodyWorks to my class schedule. However, this certification takes more than just learning and taking a class. Many of the exercises are ones that I use in Bootcamp which makes it seem less intimidating. The intimidating part is that I must now learn/memorize the warm-ups and modules for BodyWorks. This is a very new concept to me since Bootcamp & Cycle are open to interpretation. Memorizing a flow of workouts is a new challenge but I am up for it. Once I learn the structure, I have to demonstrate my knowledge and ability to our regional director. If she approves my one hour class demonstration, I will get be able to teach BodyWorks + Abs. After the BodyWorks training/certification came the easier (for me) certification which is Bootcamp. Since I already am a certified teacher for Bootcamp, I was simply getting the version for LA Fitness. I would not need to demonstrate my ability again, just simply take the class. Since I knew this, I felt like the pressure was off which made it easier to enjoy the training. The format was the same starting with the learning portion followed by the class format. The Bootcamp focuses on HIIT by hosting different stations to target the entire body. There is a heavy cardio involved and heavier weights are encouraged. Our class format for instructors had 6 stations with tricep dips, line touches, push ups or abs, bicep curls, walking lunges and step-ups. After each station, we completed a cardio round with jump rope, jumping jacks, sprints and football shuffle. Needless to say I finished drenched in sweat! I was excited to get some new ideas for Bootcamp though to start incorporating. We will see how my schedule shapes up for classes and adding BodyWorks but I am excited to have the chance in the future. I think taking these classes whether to improve your craft or add a certification is beneficial to being a better group fitness instructor. Tell me: If you could get a certification for any class what would it be? This entry was posted in BodyWorks, Bootcamp, Fitness, Group Fitness and tagged BodyWorks, Bootcamp, Fitness, Group Fitness. Bookmark the permalink.